If God had wanted most of us to see the sunrise he would have scheduled it later in the day. Because of all the rain we've been having lately in LA, I went to the mall with the kids. There they happened to have just the coolest thing ever. 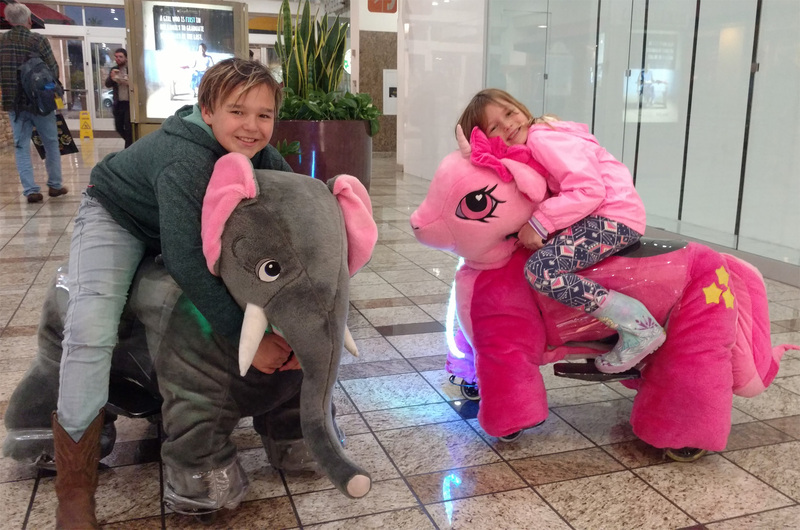 There were these large bicycle-sized animals that you could jump on and ride around the mall. Essentially, like a battery-powered, indoor 4x4 for kids. They were free to go wherever they wished, as long as it didn't run into anything, and didn't go in any stores. So for twenty bucks, they ended up zipping around the mall for about 15 minutes, having the time of their life. A good business idea, and some good, clean fun!